If you missed the Toy Safety post, go back to read it here. Today we’ve got Lamaze toys by TOMY brands. Lamaze toys are pretty mainstream and aren’t known for being “green” in particular. However, the company, that also owns my favorite Boon, is obviously set on making safe products. First of all, all Lamaze toys are made primarily out of fabric with a few small plastic components. 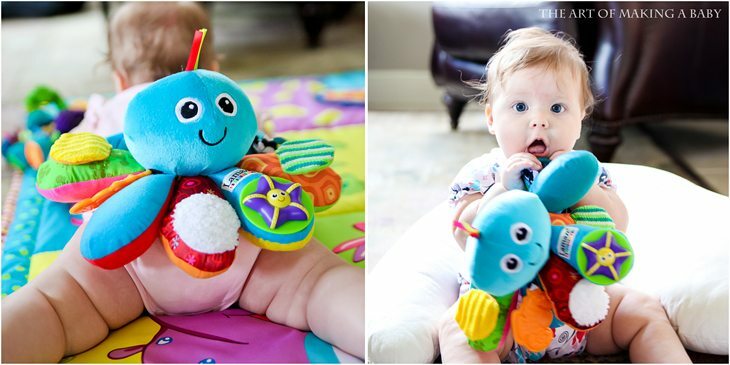 Lamaze toys are probably the most colorful interesting fun and varied toys I have seen. I like that the majority of Lamaze toys are made out of fabric, which is always safer than the safest plastic. Some components that ARE made of plastic use safer plastics like ABS, PP an EVA foam. Lexi’s favorite, the Stretch Giraffe, reminds me of a ragdoll haphazardly put together with different fabrics and materials. It has so many odd ends to chew on and play with that it has been the one toy that I could rely on Lexi being entertained by for a longer period of time ( car seat, doctor’s waiting room, etc). It has become our travel toy to take with us virtually anywhere. The Giraffe is all fabric, except for two plastic rings on its neck, and little bells and chimes in its two feet with the other two feet being a “squeaker” and a “crinkler”. Octopus, Octivity Time, is her second favorite. Again there are SO MANY things to play around with on this octopus! We’ve got a mirror, little tags, plastic rings, a teether, a little turning clickety wheel, crinkly foot, fuzzy foot, different colors, patterns, textures. The legs are nice and cushy, easy to hold onto to. This toy would probably be perfect 6 months on when they have enough coordination to make things happen and go from plush leg to plush leg. The Hula girl never became one of the toys Alexis plays with ( though these things change daily). 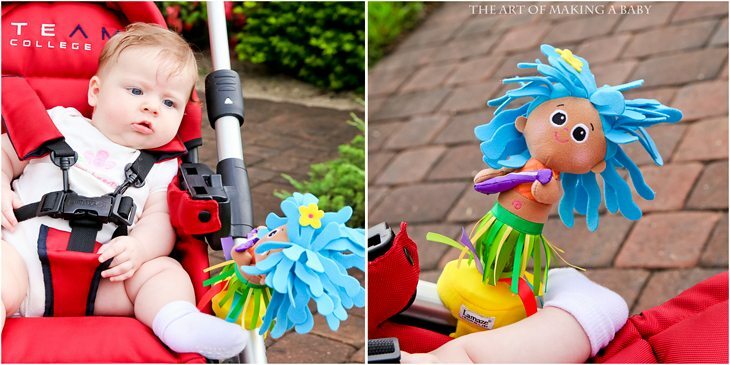 It is a great toy for travel since it can be secured onto almost anything with a stand and a velcro strap. We’ve used it on our stroller, where she dances and jingles. It is currently attached to our changing table to serve as a welcome distraction to a baby who won’t lie still for diaper changes. And in the best fashion of a book loving family…. 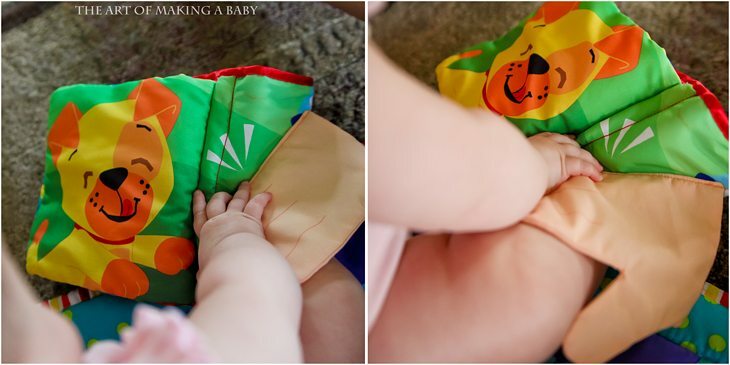 When Lexi was first starting to handle books on her own, she was obsessed with crinkle fabric books by Lamaze. The two new books, Mittens, the Kitten and Peek-A-Boo Puppy, are wordless story books that are perfect for the under 9 months crowd. Andrew and I each came up with a story in both Russian and English to accompany the book and as you might have seen in the 0-3 months Lexi Awards, these were huge hits. By the way, the three toys I mentioned above were featured in the What to Expect When you’re expecting movie. Has anyone seen it? 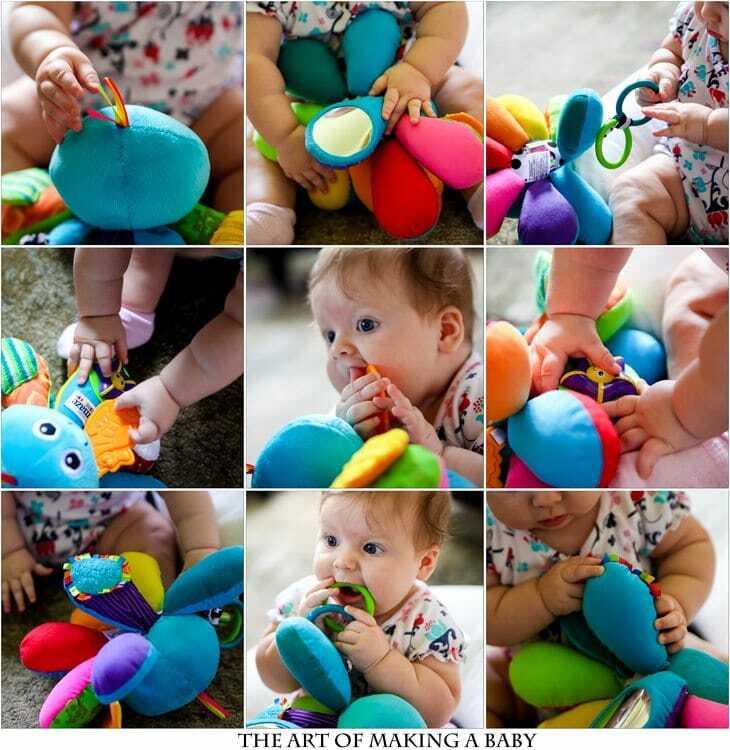 Lamaze in conjuction with The Art of Making a Baby is offering a giveaway of the three toys, The Stretch Giraffe, Octivity Time and Hula Girl. You can also buy Lamaze toys on Amazon, they are currently having a $5 off a $35 dollar purchase of Lamaze Toys. Disclosure: Lamaze sent us the above mentioned toys and books in order to facilitate this review. All opinions are 100% our own, as always. Miss Lexi channeling her Holiday Spirit…. I actually just ordered it on Netflix. Can’t wait to see it! My sons favorite toy from the time he was born to now even is a stretch the giraffe. He loves that thing. I know, it’s really a well made toy! So many things to play with! We have a lot of Lamaze toys and love them all!! The moose and firefly ones are probably our favorites but they are all great. Garrett still likes to play with them! Hey Elena! Love Lamaze toys. We have a couple in the house. Just a question.. How do you decide what brands to look into? You obviously can’t look up every single brand of toy or whatever else. Do you put into a search engine, popular kids toys and go from there. Just wondering cause I always feel over whelmed when looking up products for theo? Hey, melody! I started with a few that we already had. Emailed their customer service to see what they are made of. I also searched for organic toys and picked out companies I liked and checked them out. I also look through amazon toys to see if there is a company that I’ve never heard of, as well as other websites. My rule of thumb is the more obscure the company is the more interested I am in what kind of toys they make. That is how I found most of the toys we use. I was hoping you could answer a question for me/help me better understand something. I have Mortimer the Moose. On the label it states that Mortimer contains polyurethane foam, something that typically has a lot of flame retardant chemicals in it. I guess I thought that everything containing polyurethane foam was bad but I am wondering if there is polyurethane foam that is not chemically treated. Thoughts? Sorry for the delay in replying, I was sick. You can read about PU foam and the dangers here: https://everyavenuelife.com/2012/11/toy-safety-in-time-for-the-holidays/ It’s not of the biggest concern unless they are sleeping, lying on it and breathing that stuff, as long as it’s not sprayed with FRs.